Sony Buys Michael Jackson's Stake In Lucrative Music Catalog : The Two-Way The $750 million deal means Sony now fully owns or administers the rights to 3 million songs, including hits by the Beatles, Sting, Lady Gaga and Alicia Keyes. Paul McCartney and Michael Jackson in 1983. Jackson's share of the rights to many Beatles songs has been purchased by Sony. The Sony Corporation has announced it will pay Michael Jackson's estate $750 million for Jackson's 50 percent share of the Sony/ATV music publishing company. The backstory here has more twists and shouts than a long and winding road (Couldn't resist, but note that the rights to both "Twist and Shout" and "The Long and Winding Road" belong to Sony/ATV). Sony's purchase marks the culmination of one of the most remarkable stories in the history of the music business. It all started when Paul McCartney advised his young friend Michael Jackson that, to really make money in the music industry, you needed to own the publishing of hit songs. 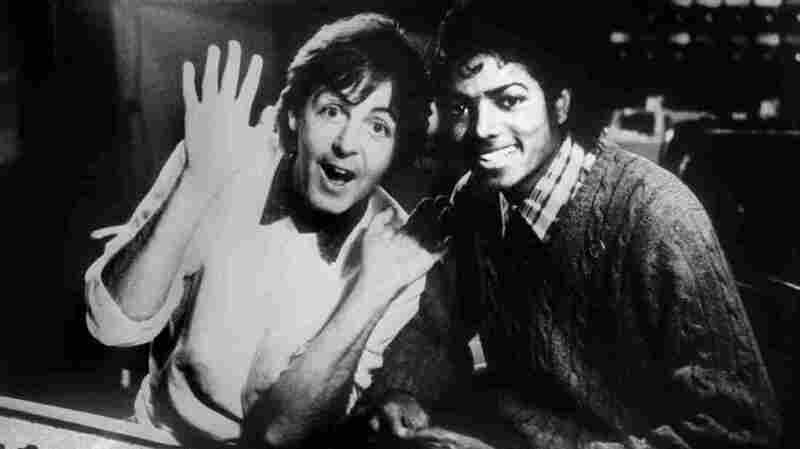 McCartney told CBS-TV in a 1989 interview that Jackson joked to him "One day I'll own your songs." To McCartney's shock, Jackson was true to his word. A music publisher owns the rights to a song's lyrics and composition. Anytime a song is performed, played on TV or radio, used in a commercial, etc., the publisher collects royalties. Contracts vary but, traditionally, that money is split 50/50 with the songwriter. In 1985, music publisher ATV owned the rights to some 4,000 songs, including more than 200 by The Beatles. It also owned Little Richard's Tutti Frutti. Michael Jackson's lawyer, John Branca, knew Jackson was looking for songs to buy. When Branca learned that the Australian tycoon who owned ATV was putting the company up for sale, Branca and Jackson put in a bid. After long, tense negotiations, Jackson was able to purchase ATV for a reported $47.5 million. In the mid-1990s, when Jackson was in debt, he sold half of ATV to Sony, forming the joint venture Sony/ATV. To get full ownership, Sony offered Jackson's estate $750 million. The Sony/ATV catalog has swelled over the years and now owns or administers the copyrights to more than three million songs, including hits by Sting, Lady Gaga and Alicia Keyes. The company controls some of the best known songs in the world, including "Over The Rainbow" and "New York, New York." One analyst tells Bloomberg, with the increase in streaming, the trove's worth is more than what Sony's paying for it. As for Michael Jackson's estate, it still owns Jackson's master recordings as well as Mijac Music, the publishing company that owns all of the songs he wrote. In a statement by co-executors John Branca and John McClain, the sale to Sony will allow them to maximize the "the value of Michael's Estate for the benefit of his children." The Two-Way was an NPR blog that ran from 2009 to 2018.